Mount Olympus does not belong to any of the Greek ranges but comprises an independed massif. Its highest summit ''Mytikas or Pantheon'' is spaced a mere 18km from the coastline, giving the impression that the mountain rises from the sea. Mount Olympus comprises a circular massif covering an area of approximately 500 km2. Mount Olympus is the highest mountain of Greece, its main summit of Mytikas (or Pantheon) rising to an altitude of 2918m. According to the Greek mythology Mount Olympus was the home of the 12 ancient Greek gods and goddesses, while in 1938 Mount Olympus was established as Greece's first national park with ultimate goal the preservation of its natural and cultural wealth. 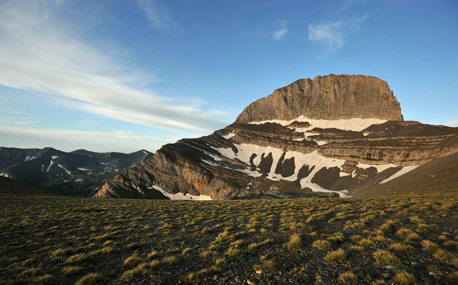 According to the Greek law, Mount Olympus National Park core covers an area of about 40,000 acres in which all kinds of exploitation are prohibited. Surrounding this core area there exists the core's peripheral zone spanning approximately 239,000 acres, its specific coverage not clearly defined yet within which only certain actions are allowed. However, today there have been serious efforts from local organizations so that the area of the National Park to be increased, since the environmental pressure from human factors is alarmingly increased every year. In 1981 Mount Olympus was declared by UNESCO as a ''Biosphere Reserve'', whereas the EU has included Olympus National Park in its list of the most important bird habitat areas. Mount Olympus morphology is generally characterized by steep slopes sharp ridges separated by deep canyons as result of past and present climatic oscillations and subsequent erosional processes. The morphology of the upper mountain (above 2000m) has been greatly affected by climatic, glacial, periglacial and geophysical processes (rain, hail, snow, wind, frost, solifluktion, variations of the tree line elevations etc), while in the lower parts of the mountain human impacts (logging, cattle and goat grazing) become more important. More specific, based on Mount Olympus present morphology the mountain can be divided in two main parts; the north and the south part. The division line mainly of tectonic origin follows an EW line along the old glacial valleys of Megala Kazania to the west and Maurologgos Ennipeas to the east. The north part of the mountain is characterized by steeper slopes, well developed hydrographic network, and deeper canyons. On the contrary, the southern part of the mountain is characterized by much smoother relief and less developed hydrographic network, probably a result of differential uplift and different geological substratum. From a geologic standpoint Mount Olympus' origin has not been well defined yet. According to many geologists Mount Olympus comprises a tectonic window of the Gavrovo Tripoli geotectonic belt, thrusted under the Pelagonian sheet, its lithology comprising a continuous (Triassic, Jurassic and Cretaceous) calcareous sequence. Others believe that Mount Olympus is part of the Pelagonian Belt, considering it an autochthonous sequence but not continuous in the time sedimentation sense (Jurassic limestones are missing). Whatever the case might be Mount Olympus is composed by Triassic, maybe Jurassic and Cretaceous limestones, while on the south west part of the mountain there exist granite outcrops and flysch. The upper mountain is dominated by the deposition of glacial and periglacial deposits, while in the lowlands thick sequences of conglomerates and alluvial deposits exist. (More information can be obtained in ''Research on the Mountain of the Gods'' unit). 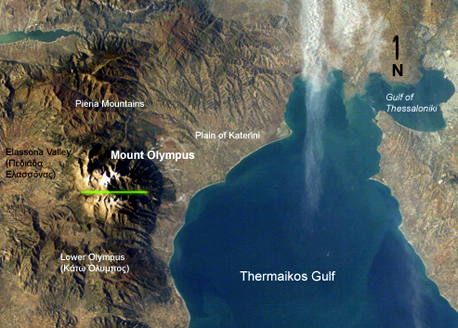 Satellite imagery obtained from NASA, illustrating Mount Olympus and its surroundings. The yellow line corresponds to the E - W division line between the northern and southern parts of the mountain. The climate of Mount Olympus is differentiated in relation to elevation, aspect and proximity to the sea. In generally the lower parts (elevation below 1000m) are characterized by Mediterranean type climate, while the upper mountain (elevation above 2000m) demonstrates different climatic characteristics with the intermediate zone being characterized as temperate. The snowfields are present throughout the year in the relict glacial valley of Megala Kazania and during cool and wet summers in other deep shadow valleys as well. 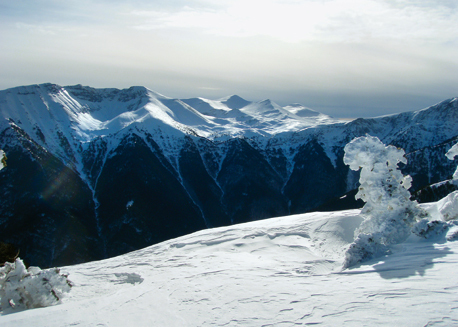 Data derived from the meteorological station located on Agios Antonios summit operated by the Meteorology Department of the Aristotle University of Thessaloniki and spanning more than a decade of observations (1979 - 1989), suggest that the average annual precipitation (rainfall and snowfall) is in the order of 2000mm, while winter temperatures range between -25οC and +5οC and summer temperatures range between 0οC και 18οC respectively. It should be noted that more extreme values have been recorded both during winter and during summer months. Due to its proximity to the sea and the location of isolated Elassona Valley to the south west, Mount Olympus demonstrates a unique orographic pattern so that winds are very common, especially on the upper mountain. In terms of frequency distribution, western winds have the highest values with southerlies, easterlies and north eastern and north western winds demonstrating successively smaller values. The highest recorded wind speeds occurred during southerlies a results of great pressure variations over the Aegean Sea, their speed reaching more than 120km/h. 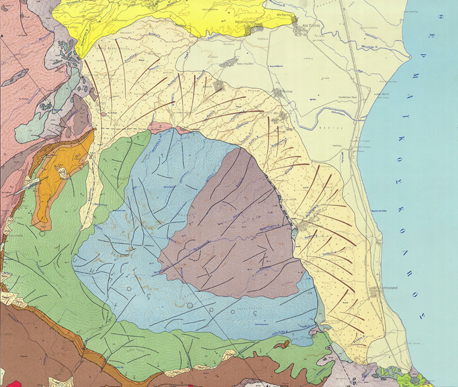 Geological map of Olympus (IGME). The morphology of Mount Olympus, the ever changing natural beauty, the almost permanent cloud cover over its peaks and the frequent thunderstorms, filled the people around the mountain with awe and admiration, which in turn gave birth to numerous thrills and myths since the ancient times. Archaeological artefacts dated since the Iron Age, have been discovered at the foot of the mountain. At the foot of the mountain 5 km from the sea there lies Dion, a sacred Macedonian city dedicated to Zeus (Dias). It is estimated that it flourished between the 5th century B.C. and the 5th century A.D. Excavations, around the ancient city started in 1928 and are still going on, have revealed archaeological artefacts from the Macedonian, Greek and Roman Eras. The majority of these artefacts is exhibited in the museum of Dion. Piblia and Livithra are two other among the many ancient cities located at the foot of Mount Olympus and are closely related to the legend of Orpheus and the Orphic Secret ceremonies. The 300-meter north walls of Mytikas, Greece highest point. The history of Mount Olympus continued being unsteady during Roman and Byzantine times as well and even under the Ottoman occupation. The mountain was used as a hiding place for the famous ''armatol'' fighting the ''yoke of the tyrant''. During the German invasion in 1941, the Greek army along with Australian and New Zealand units fought important battles. Later on the Greek Resistance found a nestling place there. 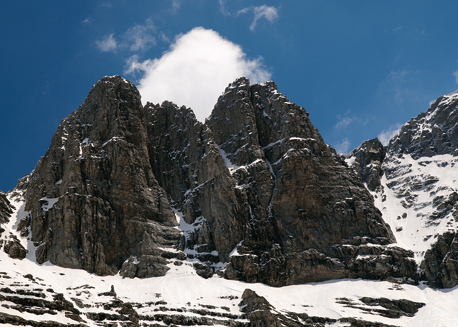 Since the 1950's the history of Mount Olympus has been dominated by mountaineering endeavours and tragedies.